Since I started wearing Sally Hansen’s Complete Salon Manicure in Iced Coffee, multiple people either been a) trying to steal it from me (I’m looking at you, Anum); or b) rushing out to buy one of their own. I don’t blame them — I think it’s the perfect taupe. 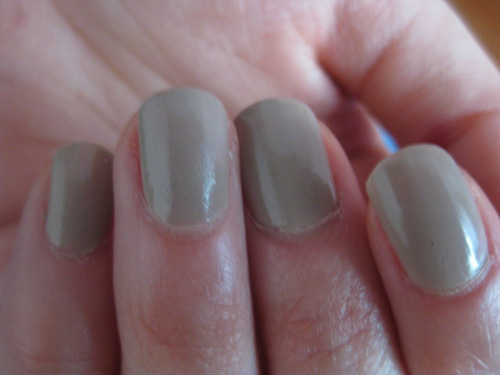 It’s a muted color, but is a noticeably sophisticated one at that. Even more, I’m falling for their Complete Salon Manicure line pretty hard. The thick brush takes some getting used to, but it makes for a quick application WITH an equally quick-drying formula. There have already been so many times where I’m just running out the door and I can just apply one fast coat and it will stay put and look shiny and neat. Not sure how much this applies for the darker colors, but you can definitely get away with it for these lighter ones. The nail polishes in the line have an all-encompassing formula: it’s a base coat, strengthener, growth treatment, shiny color and top coat in one. They are available at mass drugstore retailers for $7 each! I absolutely adore the Complete Salon Manicure. The wide brush was a bit odd at first, but I like it now. Right Said Red is my fave shade! Going to Wallgreens/CVS/Rite Aid/anywhere I can find this ASAP!